In honor of National Child Health Day, (October 6) families can download a fun physical activity program called 60 Minutes of Motion for free. New U.S. research proves fit bodies lead to fit minds in children, and in light of this news America’s Nutritionist, Mitzi Dulan in partnership with CLIF Kid, has developed 60 Minutes of Motion, an engaging deck of 25 cards that kids can mix and match for outdoor and indoor movement, play and adventure. Families may chose to use the entire deck for 60 straight minutes of activity, or pick and choose just a few cards to customize each activity experience. The interactive deck of cards combines 25 different motion, activity, adventures and games, making it easy for kids (and parents) to get active inside or out. 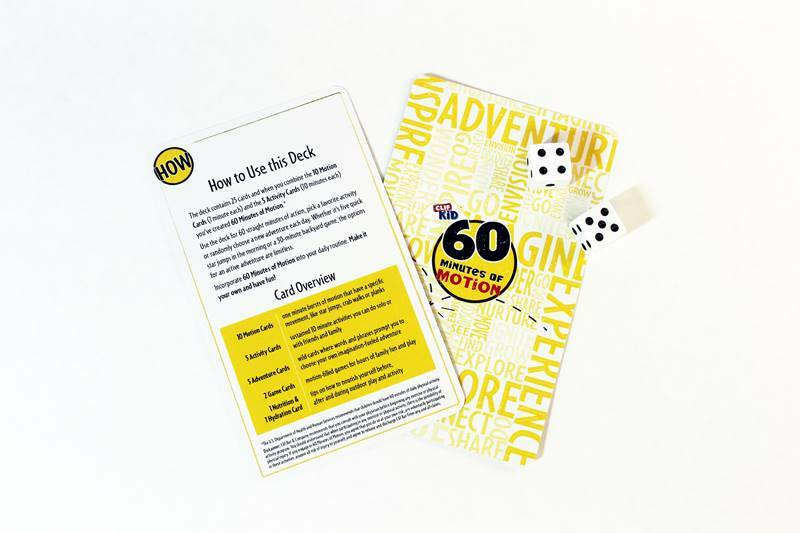 The 60 Minutes of Motion deck of cards includes 10 motion cards that focus on specific movements, like star jumps, crab walks or planks, 5 sustained 10 minute activity cards, 5 adventure wild cards with inspiring words and phrases that prompt kids to choose their own imagination-filled adventure, and 2 game cards with motion-filled games (inspired by CLIF Kid Backyard Game of the Year). Plus, the deck also includes a snack card and hydration card with tips about how to nourish yourself before, during and after outdoor play and activity. In honor of National Child Health Day, (October 6) families can download a fun physical activity program called 60 Minutes of Motion for free. New U.S. research proves fit bodies lead to fit minds in children, and in light of this news America�s Nutritionist, Mitzi Dulan�in partnership with�CLIF Kid,�has developed 60 Minutes of Motion, an engaging deck of 25 cards that kids can mix and match for outdoor and indoor movement, play and adventure. Families may chose to use the�entire deck for 60 straight minutes of activity, or pick and choose just a few cards to customize each activity experience. The interactive deck of cards combines 25 different motion, activity, adventures and games, making it easy for kids (and parents) to get active inside or out. The 60 Minutes of Motion deck of cards includes 10 motion cards that focus on specific movements, like star jumps, crab walks or planks, 5 sustained 10 minute activity cards, 5 adventure�wild cards with inspiring words and phrases that prompt kids to choose their own imagination-filled adventure, and 2 game cards with�motion-filled games (inspired by CLIF Kid Backyard Game of the Year). Plus, the deck also includes a snack card and hydration card�with tips about how to�nourish yourself before, during and after outdoor play and activity.